This could be the most iconic of all summer vacations and something every should experience once. If you've seen pictures of the Grand Canyon National Park, trust me, you haven't really seen it. The depths of the canyon, the colors of the rock, the layers of earth that seem to go on forever; well, it's something no photo can really capture. You just have to see it! Tip #1 for visiting the Grand Canyon for your summer vacation: If you can, go during the week and avoid the weekends. This place gets crowded for a reason but you don't have to get caught up in a sea of people. 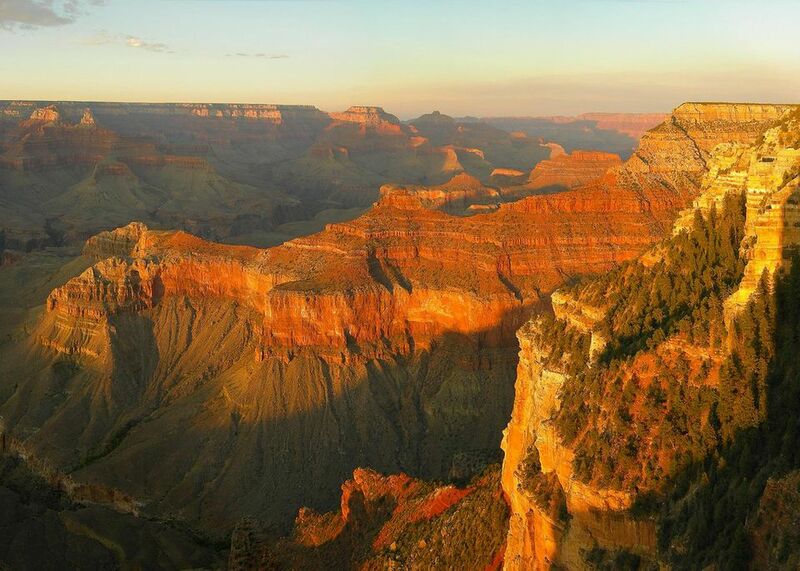 The South Rim is really popular during July and August, so check out all the entrances to the park and which one suits your needs the most. A second tip goes out to the hikers: bring lots of water! If you choose to hike to the bottom (which is an amazing experience), keep in mind that temperatures in the inner canyon can reach up 118 degrees. For an easier way to the bottom, consider mule, river, or air trips. Mules leave the South Rim for day trips as well as overnights at Phantom Ranch - the only place you can spend the night without camping. A raft trip will take you through long, quiet stretches of the canyon with opportunities for day hikes. Also, be sure to check out the free Hermits Rest Route bus which gives visitors an easy way to see the canyon. You can ride along the rim of the canyon for 8 miles and stop at some of the best overlooks of the Colorado River and Grand Canyon. No matter how you choose to visit the Grand Canyon, it won't disappoint. You can ride along the top, take a few day hikes, or travel to the bottom for an overnight. And you know what? It's all good. Once you step off the Park Service boat that takes you to Isle Royale National Park, you're on your own. Well, not technically. There are plenty of rangers, maps, and guides on hand, but this national park offers one of the best-untamed environments to visit. The rough and undisturbed area is thanks to the parks biggest rule: You carry it in, you carry it out. Actually, there are a few things you should know when you come to Isle Royale. Don't let words like "tapeworm" or "wolves" deter you from visiting this natural beauty. If it eases your mind, wolves are pack animals and try to avoid people. Besides, this park is too amazing to pass up. You can see things like Moose Exclosure, which showcases how much a forest can grow when animals aren't munching on it, or Edisen Fishery which belonged to one of the last commercial fishermen on the island. Keep in mind, your daily schedule will often rely on a boat schedule or seaplane, so bring a watch and plan out your day. It's one of the best getaways you'll ever take, one that truly takes you away from the hustle and bustle of life and into a natural wonderland. If you want a reminder of just how small you are in this vast world, head to the Giant Forest of sequoias. This national park contains big canyons and big trees (formerly two separate parks) and came together to make up one park that stretches 66 miles long and 36 miles wide at its widest point. Almost every mile of this giant wonderland is wilderness, so much so that a hiker can hike to a destination that is farther from a road than any other national park in the system. And while it's rare that any hiker can cover the park's 800 miles of trails, Sequoia & Kings Canyon National Park offers more to see and do than any other summer destination. Starting with the trees, visitors should not miss Giant Forest or Grant Grove. Within these spots, you can take in the best of both worlds. In Giant Forest stands the world's largest tree - the General Sherman Tree - about 2,100 years old, 274.9 feet tall, and 102.6 feet in circumference. It's pretty hard to describe how massive this tree is; you just gotta see it! Many of the park's trails begin at this location - it's pretty hard to miss. Also be sure to check out the Four Guardsmen - four sequoias that seem to "stand guard" over the forest. The second must-see is Grant Grove which lies within Kings Canyon National Park. It will be hard to miss the General Grant Tree, which stands 267.4 feet tall and 107.6 feet in circumference. Visitors can take note of the preserved trees while noticing how many have been lost to logging. Don't miss Centennial Stump - a stump of a sequoia that was cut down for the Philadelphia 1875 Centennial. It will make you appreciate all that the parks work to preserve. Cedar Grove is a popular destination where visitors can see other trees like live oak, white fir, black oak, and sugar pine. It's a great area to walk around, bike, and take in the trees, rivers, and meadows around. Another must-see is Crystal Cave, which does require purchased tickets to enjoy. The cave is unlike most tours, short of fancy lights, and big on showcasing the natural limestone, stalactites, stalagmites, and columns. If you really want to make the most of your summer vacation, there's no better way than enjoying two parks in one! Alaska may not be the first place you think of when you hear the words, "summer vacation," but this national park will continue to surprise you from the moment you enter to the day you leave. The park preserves 15 volcanoes, some of which are still steaming, as well as North America's largest population of protected brown bears. Within the park, you can hike, canoe, kayak, fish, and enjoy nature at its finest. And at the end of an adventurous day, you can relax in a rustic lodge watching the sun set over a crystal clear lake. Not bad, right? The best time to visit Katmai National Park is from June to early September. During this time, transportation from Brooks Camp (an area of people, bears, fish and boats) and the Valley of Ten Thousand Smokes (the most popular hiking) are open with lodges, cabins, and campgrounds. If you really want to see bears in the wild, try planning your visit during the month of July, when the sockeye salmon spawn attracts the tummies of almost 2,000 brown bears. There are plenty of amazing places to hike in the park, but be sure not to miss the Valley of Ten Thousand Clouds of smoke. The landscape is so unique and descends into the Ukak River which flows through a bedrock canyon. A great side trip to take is between Baked Mountain and Katmai Pass - Novarupta - a 200-foot-high dome of the volcanic rock. Scientists believe much of the 1912 eruption spewed magma and ash through a fissure here. It's an amazing place to see. If hiking isn't your hobby, Katmai offers many opportunities to kayak, canoe or boat. Guides and equipment may be rented/hired and ranger-led activities are also quite popular. For the serious water enthusiasts, check out the Savonoski Loop - an 85-mile round trip that takes about 4-8 days to complete. And for those looking to enjoy the sites from a distance, scenic air trips are available in King Salmon or Brooks Camp. No matter how you decide to tour the park, be sure to bring your camera! Stunning. The tranquil beauty of this national park can be summed up with one simple word: stunning. It's hard to forget your first view of Crater Lake National Park - 21 miles of the bluest water you may ever see. Not only is it one of the most scenic national parks, it also happens to be one of the cleanest. Thanks to some of the cleanest air in the country, visitors can actually see more than 100 miles from some points of the park. Though scientists may not completely understand Crater Lake's ecology, we do know the lake was born thanks to a volcanic eruption, Mount Mazama, around 5700 B.C. The eruption created a giant caldera which filled with melted snow and rain, thus creating a lake that's more than 1,900 feet deep. And that lake is just unbelievable. Crater Lake truly displays its most vibrant and clearest colors in summer with wildflowers peaking in July and early August, so plan your trip accordingly. Be sure to bring your best hiking boots as the park offers a fantastic setting for day hikes. With more than 100 miles of trails, visitors can expect stunning views of hemlock, pine, and fir trees, as well as deer, black bears, deer, bobcats, and marmots. And be sure to keep your eye on the sky for a sighting of eagles and hawks. Try to spend at least a half day touring Rim Drive, 33-miles of overlooks and hiking trails. You will come across Discovery Point - where gold miners searched in 1853 - and Wizard Island, which got its name thanks to its striking similarity to a hat. Also be sure to bring your camera to Castle Crest Wildflower Trail for a fragrant and beautiful stroll of bright flowers and lush forest. A must-see is Mount Scott Trail, which is thought to be the park's most beautiful trail that climbs 2.5 miles past the park's highest point and offers a panoramic view of Crater Lake. And although hiking will showcase the park's beauty from the ground, visitors should not miss its appeal from the water. A boat tour will show you a completely different perspective of waterfalls, canyons, and cliffs. Crater Lake is a sight to behold and one everyone should see at least once.